This multi purpose pillow has a new curved shape that is perfect for feeding, tummy time, after feeding support and relaxation time for baby. It has a wide platform for extra support and balance and wall shaped sides to provide a flat stable surface. 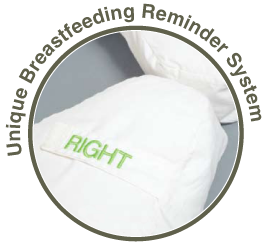 All of these features combine to ensure that you have a good upper body posture when feeding as the weight of the baby is evenly distributed and the baby is comfortable and relaxed. It comes with one removable pillow case and an 100% organic cotton pillow case is also available.